What is worn in our school, must be purchased from our school. If money is an issue, start with the chest and head safety gear. For full protection on delicate hands and feet add 2 and 3.
add 4 and 5 mandatory for Red Belts and above. USE YOUR BROWSER BACK BUTTON TO RETURN. 1 Hand Gear $49.95 Personalized with PMAFA logo! Features double layered padding over high-impact and sensitive areas such as knuckles, instep and ears. The Thunder Double Layered gear offers excellent flexibility and movement and is well ventilated for better comfort. Hook and loop closures provides a snug fit. Sized to fit children through adult. 4 Shin Protector $12.95 Covers shin area from above the ankle to top of shin. Great for padding injured or sensitive areas. Black Belts should definitely have these. 5 Arm Protector $12.95 Your forearms make a lot of blocks when sparring, so you need to make sure they have proper protection. Our forearm guard features 1/2" of padding from wrist to elbow to help cushion the blows. For better flexibility a curved joint has been designed. 6 Supporter & Cup $12.95 A more traditional tuck-under design for athletic activity that adds more cup around and under the groin. Vinyl edges around cup increase comfort around inner thigh. Cup also features ventilation holes for additional comfort. 7 Mouth Guard 2.95 This lightweight mouthguard has extra cushioning to help protect your teeth. Use during any activity. Easy instructions to follow to fit mouthguard to your upper set of teeth in seconds. Available in 2 sizes, youth or adult, and assorted colors. Case, sold separately, holds one single mouthguard. Add $2.00 for carrying case. 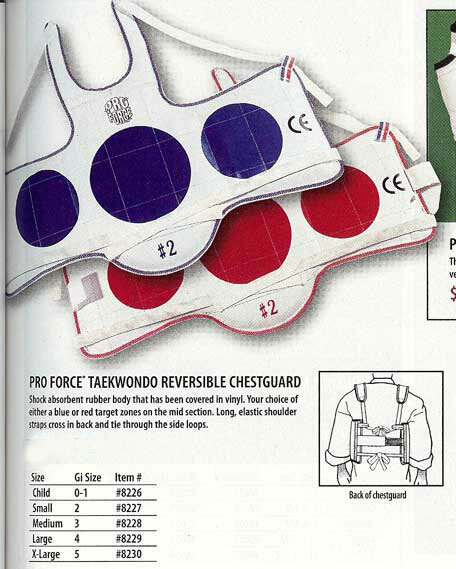 8 Chest Guard $39.95 This taekwondo style chestguard features a shock absorbent rubber body that has been covered in vinyl for added durability. The white shell is reversible showing your choice of either a blue or red target zones on the mid section. Long, elastic shoulder straps cross in back and tie through the side loops, plus hook and loop fastener to ensure a snug fit. Sizing for chest guards is based on your uniform size, so check the sizing carefully. The next two items are recommended for parents and students that wish to work on face defense at a higher level. Mouth protection is optional with these head gear. 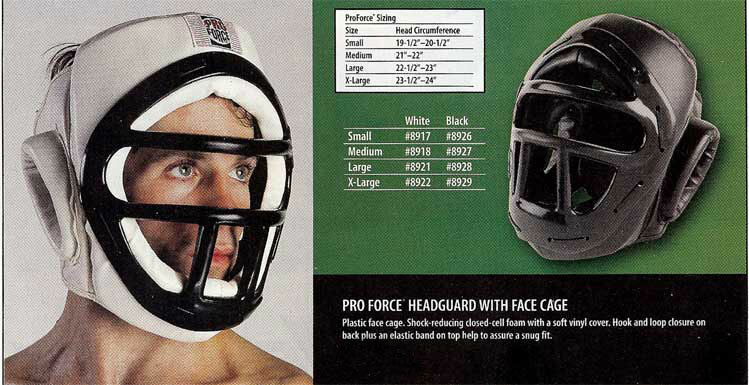 $79.95 Reduce the risk of a broken nose or black eye with this great head guard from ProForce®. Covering the face is a plastic cage that limits access to the face and helps absorb blows to the rest of the head during sparring. Made of shock-reducing closed-cell foam with a soft vinyl cover. Hook and loop closure on back plus an elastic band on top help to assure a snug fit. This guard only sized up to a 6 or 7 year old. 49.95 Protect your face in comfort! 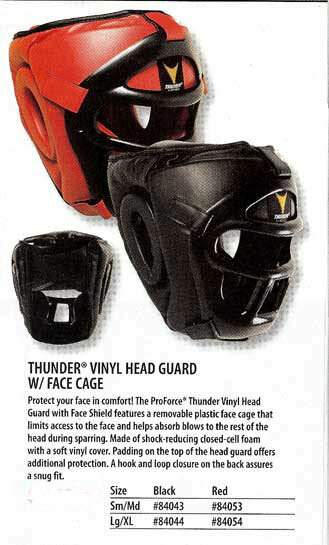 The ProForce® Thunder Vinyl Head Guard with Face Shield features a removable plastic face cage that limits access to the face and helps absorb blows to the rest of the head during sparring. Made of shock-reducing closed-cell foam with a soft vinyl cover. Padding on the top of the head guard offers additional protection. A hook and loop closure on the back assures a snug fit. 10 Head Gear & Face Shield $79.95 Personalized with PMAFA Logo and double layer coverage that measures 1-1/4" thick. Removable vented poly-carbonate face mask. Hook and loop closure on back for a secure fit. Multi air-flow channels help keep you cool. Complete cheek and jaw protection. Other suggested items follow below. They are not mandatory, but they will serve a great purpose. 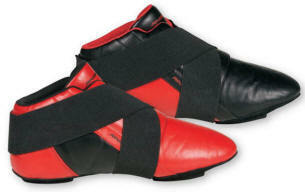 (Limited Sizes) $79.95 These brand-new, never-before-seen sparring foot gear are made for indoor, sparring use only. They are approved for competition by NASKA, IKF, ISKA and over 60 other sanctioning bodies. The shoe features extra padding on the instep, a soft, flexible sole for added traction and additional coverage on toes to prevent injury. 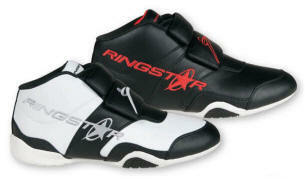 Plus, the new and improved RingStar R3 Technology is utilized throughout the kicks. (Limited Sizes) $69.95 The Foot Pads are to be used for indoor sparring use only. They include a double fastening structure for an extra secure fit that will not twist around the ankles. The instep features extra padding while the sole provides increased coverage on the toes and extra traction. RingStar R3 Technology with closed-cell foam is also used throughout the foot pad. More Bags $39.95 These great 22” long x 11” diameter leatherette sport bags are the perfect size to carry whatever you need wherever you need it. Zipper is centered on top for maximum storage capacity plus two zippered end compartments for additional storage. Both end panels and one side panel feature a silkscreened design. Welted seams for extra strength. An open side pocket is located on the side panel opposite of the design. Two black carrying handles and an adjustable black shoulder strap make for easier transporting. Shoulder strap is also detachable. Great for any activity! Order yours today! Click here to see more suggested bags in this price range. 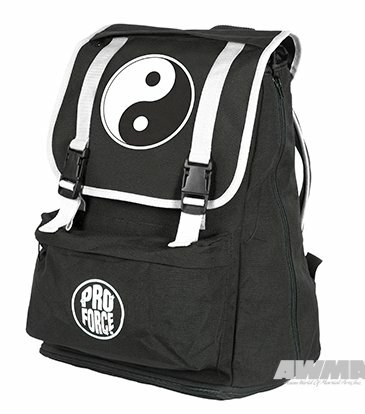 15 ProForce® Yin & Yang Locker Gear Bag $59.95 This bag can hold virtually everything. Made of a heavy 60D fabric. Zippered top flap offers you full access into the bag. Two extra wide zippered side compartment feature mesh panel to allow your clothes or shoes to breathe and dry out. Detachable and adjustable shoulder strap. Yin and Yang logo on each end plus on front. Size: 27 in. x 15 in. x 12-1/2 in. 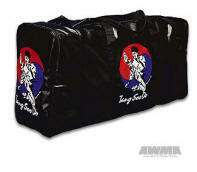 More Bags $49.95 The bag for virtually every activity! At 27” long x 9” wide x 13” deep, these leatherette bags are huge! Double zipper opening on top allows for maximum capacity. Welted seams for extra durability. Both ends feature a silk screened design plus zippered compartments. Design also silk screened on one side panel. Black adjustable shoulder strap easily clips on and off. Two carrying handles are reinforce, double stitched for extra support. Great for carrying all your protective gear, weapons, uniforms and whatever else you need. You won’t believe how much these bags can hold! Click here to see more suggested bags in this price range. 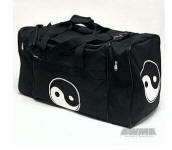 $59.95 Made of a heavy 60D fabric, these spacious bags are strong and durable. Features one large main compartment with a U-shaped zipper opening, zippered end pockets w/ meshing to allow your gear to "breathe", a separate shoe compartment and a separate paddle compartment. The Ultra Bag measures 22" x 12" x 14" and has a padded adjustable shoulder strap. This bag is great to carry all your gear! it must be approved by the school and purchased in house.